At Jensen Gardens, we love spring! 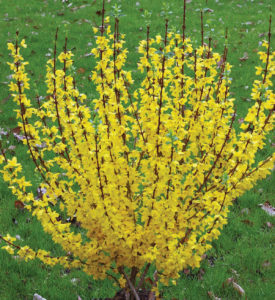 Two of our favorite shrubs that bloom in April are Forsythia and PJM Rhododendron, and two of our favorite trees are Royal Raindrops Crab Apple and Autumn Brilliance Serviceberry. Learn more about each below. PJM Rhododendron is a durable, pretty rhododendron with bright lavender blooms that pop against its dark green leaves. This plant works well in Nebraska because it can withstand heat and cold – and we get a lot of both here! We love adding PJM Rhododendron to client landscapes and containers alike. The Royal Raindrops Crabapple boasts beautiful magenta blooms and purple foliage. This tree’s look coupled with its low-maintenance and resistance to disease make this an ideal choice. Not to mention its tolerance to heat and drought! 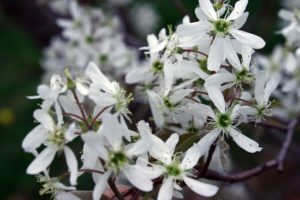 The Autumn Brilliance Serviceberry is small in size which makes it great for any landscape, and it also blooms! (Can you sense a theme with us, here?) This tree blooms beautiful, peaceful white flowers and produces a sweet fruit (a bird’s delight!). It can be overwhelming to determine in what part of your landscape plants will thrive, when to prune, and how to best space out shrubs and trees for the most functional design. We can help with all your planting and maintenance and have licensed arborists on staff! Give us a call at 402.253.8880 for a complimentary house visit and consultation.